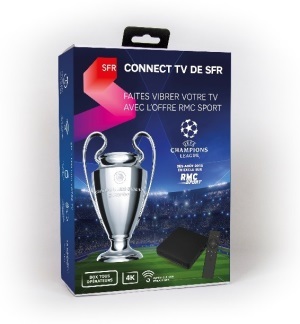 The operator SFR has unveiled a new offer called Connect TV. It is an Android 4K box offered at a price of 69 euros and giving access to various video services. With this Android box, the operator openly targets Champions League fans, but not only. For several months, SFR has decided to no longer restrict its premium content to its subscribers alone. For example, it is possible to subscribe to the RMC Sport bouquet, which exclusively offers the broadcasting of flagship football competitions such as the Champions League, the Europa League and the Premier League, while being a Free or Orange subscriber. On the occasion of the launch, subscription to RMC Sport entitles you to 1 month free of charge. You will have understood it, in addition to the 69 euros, it will be necessary to add a subscription up to 19 €/month without commitment. For the moment, the RMC Sport offer is available for 9 euros/month. As for the Cinema-series bouquet, it costs 10 €/month. Such a device can transform any HDMI television into a Smart TV. The interface of the box does not deviate from that of Android TV 7.1 but adopts as expected the color code dear to SFR. Connect TV provides access to the Google Play Store and is compatible with Google Assistant. Jellyfin is a cross-platform application that allows you to create your own media server. Jellyfin is an open source software created from Emby's code, an old alternative to Plex. Jellyfin For Android is a client application that allows you to access your media server from your Android device.